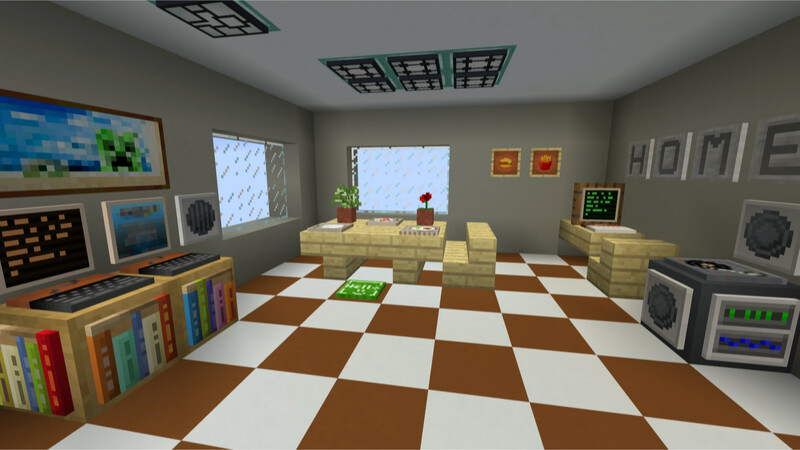 A useful collection of tools and calculators for Minecraft players to use as they build and explore their amazing Minecraft worlds. This is a great way to know the exact direction to travel when you know your start and end coordinates. This can be really useful if you’re flying long distances, especially in the End over the void. Just enter in the start and end coordinates and you will see exactly what angle to travel and also see how many meters the trip will be. Chad from OMGcraft did a video explaining it, too! To see what direction you are facing use the F3 menu and look at the ‘Facing:’ line on the left side. The first number on that line is the direction you are facing in degrees. Turn to the correct angle and start your journey in the most direct route! Use this calculator to figure out the placement for your portals so they align as accurately as they can with each other. If you’re having trouble correctly linking portals, many times it can help to tear one down and create a new one based on the two portals being as close to these exact locations as possible. This can be especially useful if you have many portals in a small area that are not linking correctly. Use the same block location for both portals. So if you check the North side of one portal make sure you are checking the North side on the other, too. The Y position does come into play when determining the most accurate postion of a portal. Portals in the Overworld cannot link to portals that are above the Bedrock in the Nether — so the Y position will max out at a safe number of 118 when matching to high portals in the Overworld. You can have portals above the Bedrock in the Nether but they will only work going to the Overworld and not the other way. 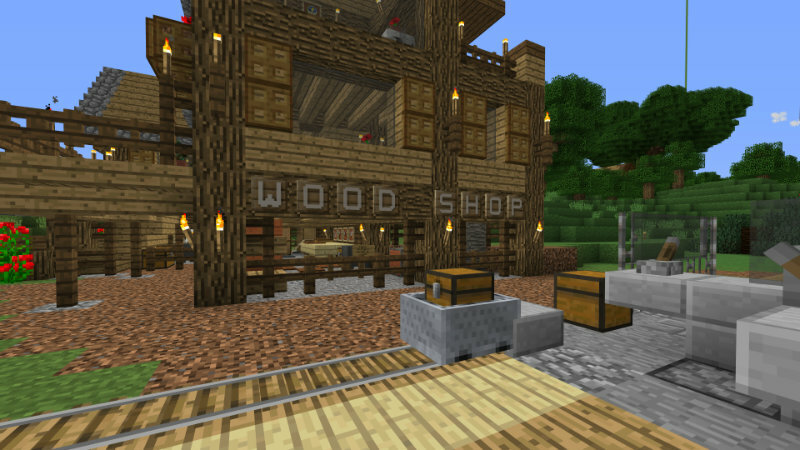 FIND OUT WHere to place blocks in Minecraft to build accurate ramps, Angled walls, Torch Trails, Lamp posts, and more! This web app will give you all the correct postions for blocks between any two locations. A few possible examples would be to get the block locations for a long ramp, a road at an angle, walls that are not straight or that may go up hill, large rooftops or locations to place lamp posts on an angled path every 15 blocks. Simply input the start and end locations for the blocks. If it will be used for a solid structure such as a road or a wall you set the spacing to 1 so there are no gaps. If you are using it to determine blocks that will be spaced out such as lamp posts or torches along a road you would enter in the distance between each item. If you are building a roof or a ramp and you want the incline to be smoother select the ‘use half slabs’ option and then slabs will be indicated in the Y position by the '.5' addition. The data will first list the block number, then the X, Y and Z coordinates in that order. For large results you can scroll to see the full list. You can finally have a real use for all of those poison potatoes that you get in your world! 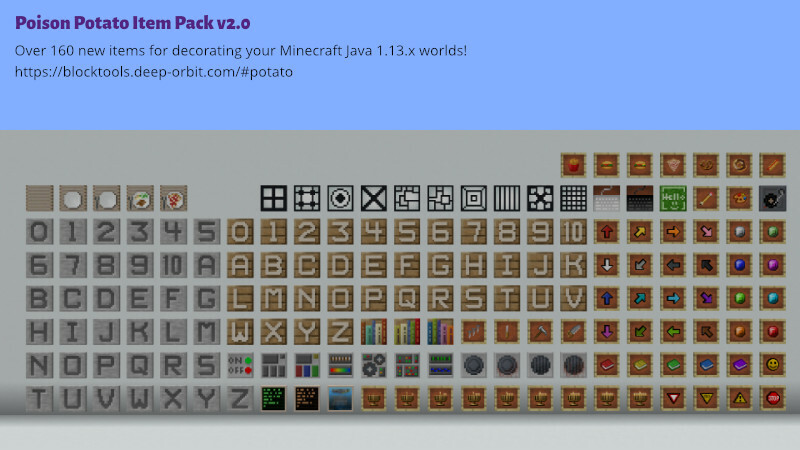 With this pack you can change a poison potato into any of these custom item textures when you rename it in an anvil. Place the pack into your ‘resourcepack’ directory to install it. Simply put a poisonous potato into an anvil and rename it with one of the names listed in the read me included with the download. 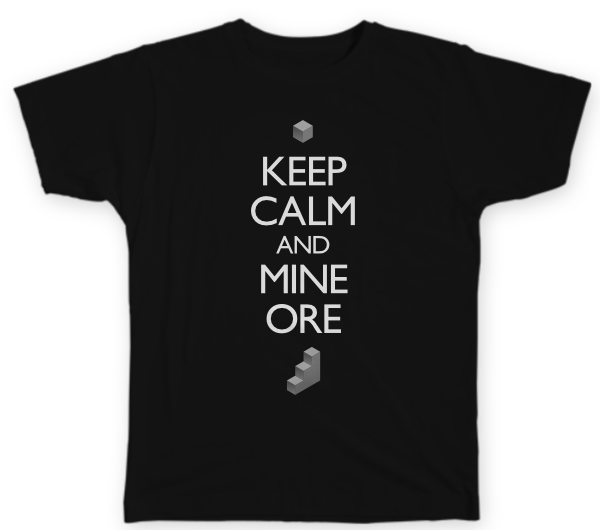 You must be running OptiFine in order to use this pack. The pack is great to use with item frames and includes new textures such as letters for signs, arrows, food items, tools, gems, light and mechanical panels and more! The latest version requires Minecraft Java 1.13.x or later to run. 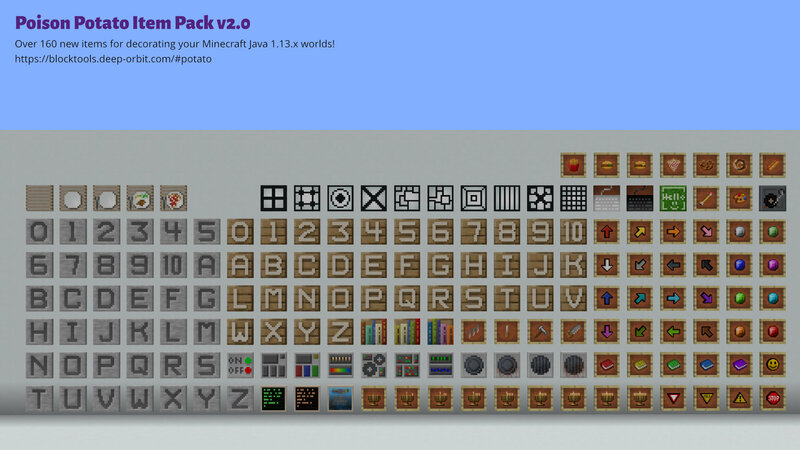 If you are using an earlier version of Minecraft try to use the 1.02 version of the pack. 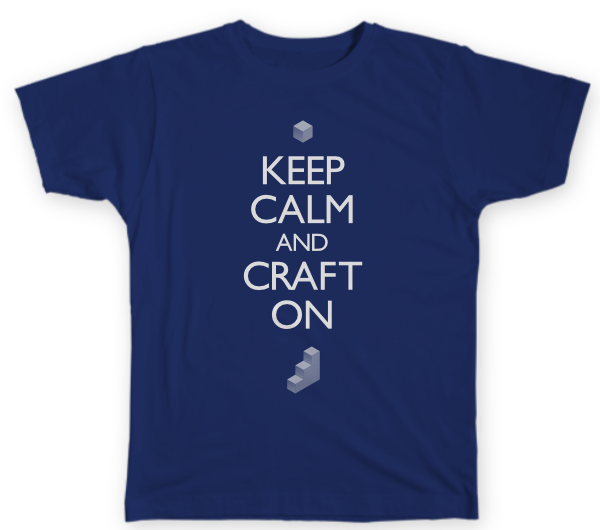 Visit our Threadless shop to see the different shirts available! If you ever want a color or item that isn't listed just contact me and I can add it. These are all tools that I created to help me while I play Minecraft. 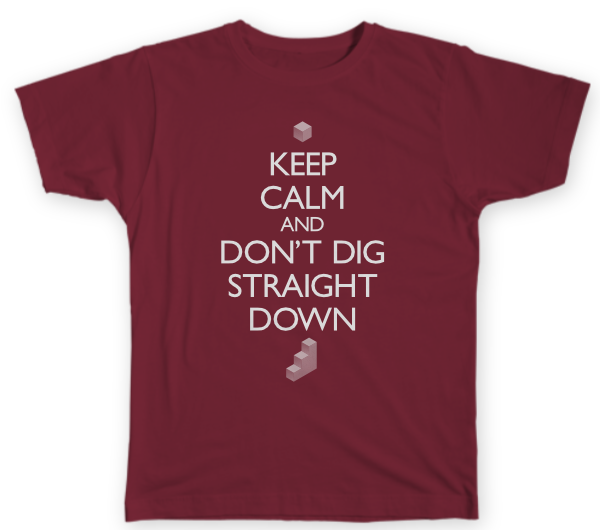 I wanted to make these available in case they might help other people as they play and build in their world. If you have any suggestions for the site or ideas for new textures in the Potato Pack feel free to contact me! As I update the Potato Pack with new textures I'll post the update here so you can have the new textures as I add them. If you use the contact form on this site your email will not be used for any marketing purposes or given to any other 3rd party. It will only be used to communicate with you directly.